Luke is a Social Media Volunteer in the Galapagos. Here he shares his insights from his first few weeks on Isabela Island. Exploring the island with study abroad students. It has been a week since I landed in the Galapagos Islands; it already feels like I belong here. I don’t mean as if my whole life I dreamed of living in the Galapagos, rather, I have experienced such a fun and exciting welcome that my mind has already accepted the people I’ve met as friends and family. The people involved with IOI are eager to include me in the programs and activities around town and have become friends that I hang out with daily. My position as a social media volunteer has given me insight in to the mission of IOI as well as the opportunity to experience the local lifestyle. It has been a week that has given me inspiration and motivation to do my best while I am here- I see IOI as a place that produces real change. Photographing the endemic species’ roaming the island, observing the Miami students in their study abroad program, interviewing locals, travelling to the highlands on farm visits… it’s a job description I can gladly say I love. In just this first week I have settled in to my new lifestyle. Living with my housemates is never boring- chatting in the morning over hot cups of coffee, going out to eat and spending an afternoon at the beach are becoming memories I won’t forget. 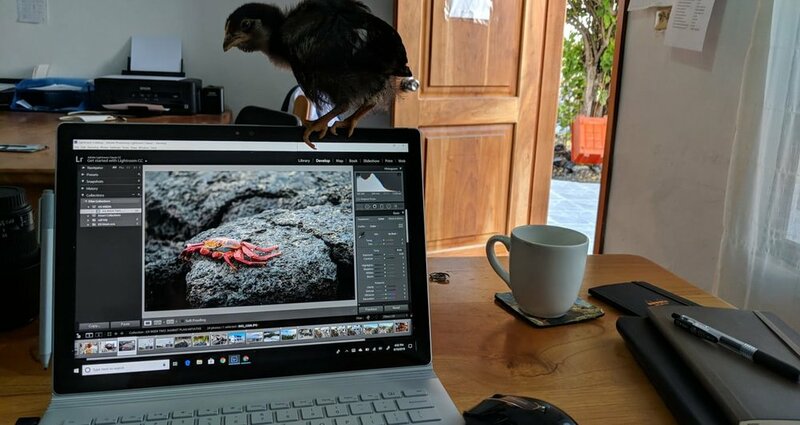 A chick rests on top of my computer as I work. This last week has been quite action packed for me. A week ago, as I was writing my last blog, a baby chick walked in to the office. Obviously not taking notice of the very concentrated-looking human, it hopped and chirped its way on to the arm of my chair, then my desk, and finally perched itself on top of my computer. Of course, I’m not one to get in the way of someone else’s happiness and so I took a quick picture and allowed it to have its fun. A little bit of poop cleaning later and the chick was on its way out the door. This might be the only place in the world where I can start my week in that fashion. I have learned quite a lot this week. To start, I began working on my open water diver certification with a local dive shop; they love to see me learning and constantly check up on my reading (I may slack a little on that part). I also broke a couple of mental barriers for myself. In the past I have never really been much of a dancer. I just don’t have rhythm. But, turns out all you have to do is ask a friend that loves dancing and you are bound for success; a few of my friends had a blast trying to teach me to salsa. In the middle of a crowded dance floor, I didn’t have to worry about how ridiculous I looked and soon enough I was salsa-ing the night away. To top it all off, I started surfing. I’m not the most balanced person and things like skating and snowboarding have always ended with some bruises for me. Hence, my resolve to simply observe the surfers. But, to not try while I was here would have been idiotic… and with a little beginners’ luck, I have gone to surf almost every day since then. The local surfers ended up giving me a couple lessons and still love to watch me constantly fall off my board. I have finally become familiar with the town. Going shopping to make dinner with my housemates is a great time. And as a bonus, I now know where to find the cheapest chocolate to feed my addiction. Thinking about everything I learned, I’m more than happy with what the week brought me, and I now have some skills to master in the coming weeks. Not me but someday I’ll get there! Over the last week this town has grown on me. I regularly hang out with the locals and never run out of things to do. Surfing is becoming one of my favorite activities, and I am almost done with my open water diver certification. I am starting to realize how special these memories are to me. I have also been gathering with friends regularly for things like pizza or pasta nights. There is something to be said about pizza night in the Galapagos. Having all your friends at the IOI kitchen along with a whole lot of homemade dough. Everyone brings their toppings and shapes their own dough. What you end up with is about 10 or so misshapen, steaming hot pizzas over the span of a few hours. Instead of people eating just their own pizza, the pizza is passed around and either praised or embarrassingly critiqued. We all tend to agree that waiting on each pizza is a little annoying, but it ends up being worth the wait. Last night the Miami students and I joined the local soccer matches. There are multiple fields in Puerto Villamil but this one is right next to the beach. They play in teams of five and only to two or three goals. Some of the teams are incredibly skilled and very competitive, but others, like mine, are just there for some fun. It is exciting watching the skilled players move the ball around so naturally. I think I should bring some popcorn next time to enjoy the show. After playing for 3 hours, my legs are plenty sore today. My volunteer work has been giving me amazing insight into what I might want to continue doing in life. My social media position offers lots of opportunity for adventure and meeting new people. To be completely honest, however, it is easy to lose track of any work I need to do when I become ‘distracted’ by the beautiful island life. Growing up in Miami, Florida I was constantly surrounded by Cuban culture – the coffee, the music, the language, and the people. Cuba has always felt like a fairytale place that I would only hear stories about or see pictures of – it was this fascinating yet “forbidden” place in my mind. IOI broke down that barrier and helped me go on a trip that’s felt out of reach my entire life; doing something I love doing – SCUBA DIVING! 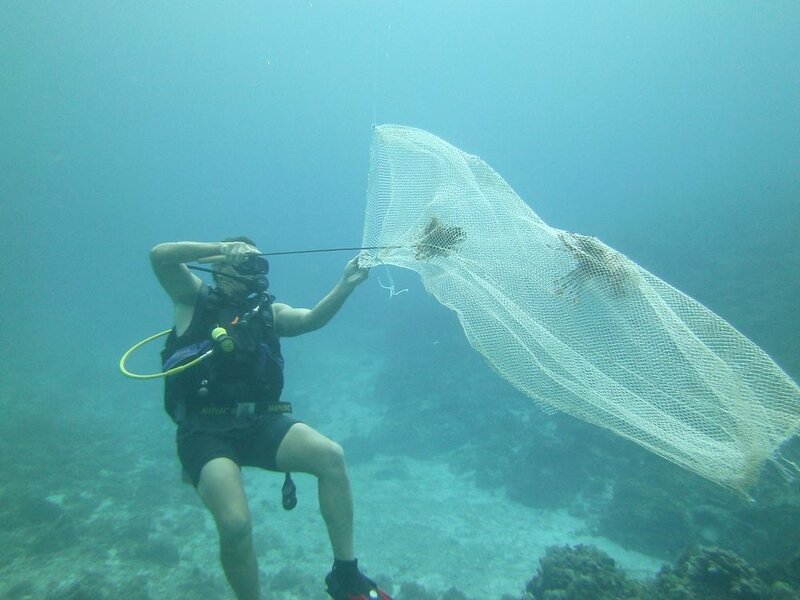 All of this while volunteering for a wonderful cause – restoring coral reefs! Having lived in Colorado for 7 years now, my biggest fear heading into this trip was the language barrier and that I was traveling alone. Not to mention I felt a little rusty with my diving skills. Being forced to overcome my fears, because that was my new reality, those fears actually became the most empowering parts of my trip. Everyone I met in Cuba was always willing to help in any situation and everyone was very patient with my Spanish. The community of Cocodrilo was especially patient, kind, and friendly. My fear of traveling alone was quickly overcome by all of the new friends I was making in Cocodrilo. Reinaldo (aka Nene - the dive master and IOI representative for the project in Cocodrilo) was an amazingly patient and kind dive instructor. My fears of being rusty at diving were also quickly overcome the second we got into the water. Getting to Cocodrilo is definitely an adventure and if you go into that with that mindset, you will enjoy the experience so much more. Knowing that the small airports, possible airplane delays and long bumpy car ride will take you to one of the most beautiful and unique places on earth is the right mindset to have. I spent a few days before my travels to Cocodrilo in Havana and Vinales and I enjoyed experiencing Cuba in this way before heading to Cocodrilo. The best part about traveling with IOI on this adventure was how supported I felt. It can be daunting thinking about arranging car rides in a foreign place, getting to the airport, traveling around an unfamiliar country in general, and dealing with delays in another language. But with IOI, I was taken to the airport by Enrique when it was time to fly to Gerona, and then received the same phenomenal service when I was arriving and departing from Gerona. It made my travels so much easier knowing that I was always going to have someone waiting for me on the other end of a plane ride. The Havana terminal for domestic flights is smaller than for international flights and does not have much to it - there is a place to grab snacks and water, but I would recommend doing that before you arrive at the airport. The plane ride itself was short and sweet. The Gerona airport is quaint - you walk off the plane and into a small room with one baggage carousel. Once I got my bags, I left that room, found Reinaldo (a different Reinaldo from the dive master) and we were on our way to Cocodrilo! It’s about a 2.5 - 3 hour drive on a very interesting “road.” My excitement had me uninterested in the amount of time it was taking or the bumpy nature of the ride but rather taking in my surroundings and the cool, salty air. We stopped after about 30-45 minutes in the car to head to the local immigration office where I had to show my passport and my slip of paper authorizing me to head into this part of la Isla. I felt, and still feel, so lucky to have been granted access to this remote part of Cuba that most Cubans don’t even know about! Dinner was waiting for me when Reinaldo and I arrived at “Villa Arrecife” and I quickly learned that I was going to be very well accommodated. Between having a comfortable room in a beautiful house and eating SO WELL for every meal, I was able to completely immerse myself in the experience of being in Cocodrilo. The town of Cocodrilo is small. Really small. My favorite part of it being so small was not only interacting with locals, but really getting to know the people of the Cocodrilo. I made some great friends that I know I will maintain contact with for the rest of my life. Everyone I met was genuine, helpful, friendly, and outgoing. Living in a small town means lots of time together, sitting on the porch, walking to the beach, or watching/participating in a pick up soccer game. You get to spend lots of genuine time together - not looking at cell phones or distracted by computers - it’s magical! One of my favorite parts on the weekend was heading to the "circulo" to listen to music and talk to locals, folks from Gerona, and others from La Fey. Making sure you’ve got everything you’d need is going to be key before you head to Cocodrilo. Being in a small town means there’s not much to buy besides chips, soda, rum, and other things like this. I highly recommend following the IOI packing list and not skipping over anything! An average day consisted of a morning dive volunteering and free time in the afternoon. Diving with Reinaldo (Nene) is a great experience. He’s patient, slow moving, and very communicative which makes it easy to feel comfortable in the water regardless of how much time has passed since your last dive. My 3 weeks volunteering consisted of completing fish counts, conducting trash pick-ups, hunting lionfish or cleaning the PVC pipes underwater where the corals were growing. Afternoons were free time and self-driven. 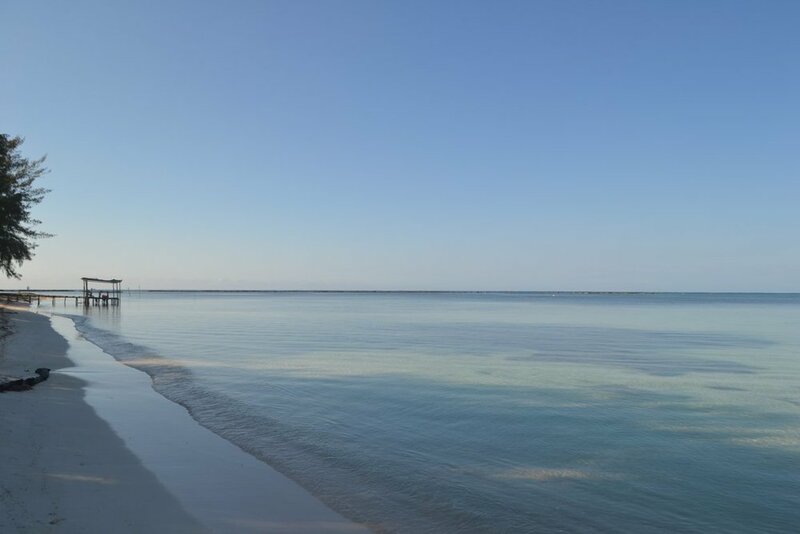 There’s great snorkeling and exploring around Cocodrilo. If you interested in exploring more, going snorkeling or doing more than that, there’s usually someone there who’d be happy to go with you - all you have to do is ask! I was in Cocodrilo for 3 weeks and I was never bored, and I read more books than I have in 3 years! Cocodrilo is the perfect place for disconnecting from technology and the fast-pace nature of your life. It’s a great place to reconnect to nature, recreate those genuine people to people interactions and focus on yourself! I had such an incredible, life changing experience on my trip with IOI to Cocodrilo. Pre-Trip communication was clear and my pre-trip questions were quickly responded to. I felt extremely prepared and well informed for my trip. During my trip I felt well taken care of and supported by the IOI Cuba staff. The volunteer opportunities were very accurately advertised and the diving and snorkeling around Cocodrilo were breathtaking. 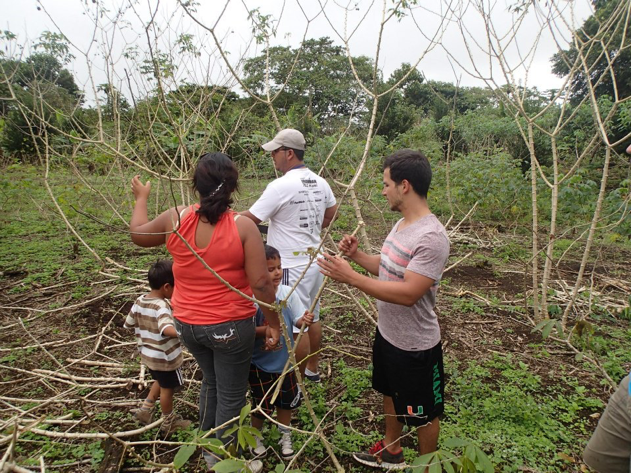 The house (Villa Arrecife) is very comfortable, the community is nice, safe, and engaging. The food was amazing - delicious, filling, and healthy! It felt so empowering to be a part of this program and to be able to help. There is so much to do and so much to see in this small town! I cannot wait to be involved in another program and return back to Cocodrilo! After studying abroad no fewer than eight times between high school and grad school, you could say I am a big fan. Language programs, college courses, student exchange, volunteer teaching, learning traditional Ghanaian wood carving, I couldn’t get enough. Each type of trip was a completely different experience, but all offered me the chance to get out of my natural habitat, out of my comfort zone, and immerse myself in a new place and culture. Years later when I started teaching study abroad programs, I found it even more rewarding than my experience in standard classroom-teaching because students are so much more excited to learn on study abroad. They are ready for a life-changing experience, ready to broaden their minds and challenge their beliefs. While there are difficult days when students are hot, mosquito-bitten, and completely sick of eating rice and beans, I see them rise to the occasion to make the most of their experience. I learned that lesson first-hand in college, studying abroad in the Galapagos through the University of Miami and IOI: when you have planned, saved up money, and had to take 2 planes, a ferry, 3 buses, and a boat to get to where you are going, you are committed. 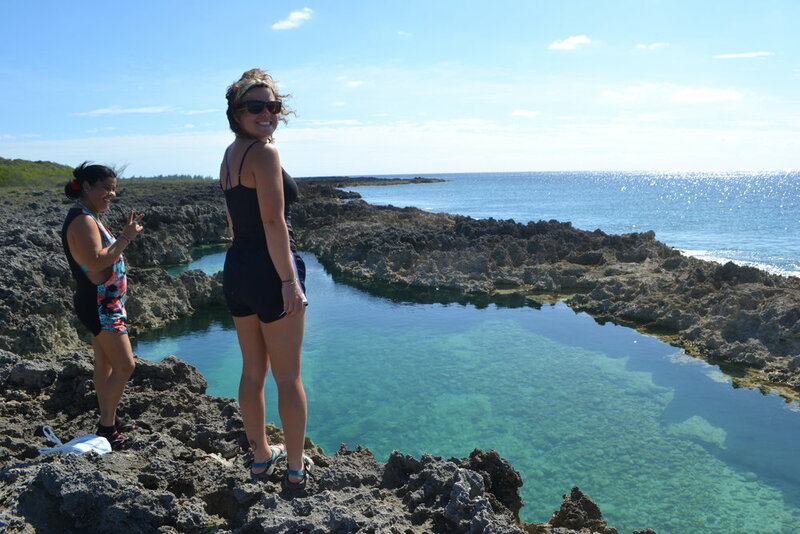 In the Galapagos, I lived with a wonderful host family and explored the islands, studying biology, sustainable agriculture, and conservation. There, I developed skills in adaptability, enthusiasm for cultural immersion, and building strong relationships which I still maintain today. My strongest memory from that trip was a bike excursion I took during my first week on Isabela Island. One morning I went up to the highlands on the side of the volcano with two other IOI students, Jimmy and Joel, to conduct interviews for a class in Political Ecology. We were learning about where people got their drinking water on the island, looking at personal catchment systems and larger bottle distributors. We had biked to our interview site from Joel’s host family’s farm and intended to bike back to the farm for lunch and then down the mountain back to town. However, after biking for a few hours, we realized we had gotten lost. Turning down random paths between jungle and farmland, we looked for familiar landmarks. A big tree, next to some vines, a barbed wire fence, and a few boards of wood that perhaps at one time were a bench… And if you know the highlands, you know that is not a promising landmark – it describes pretty much the entire mountainside. Still, as avid cyclists, we were enjoying our detour until Jimmy’s front tire popped. Well now we could not even just bike straight back to town. 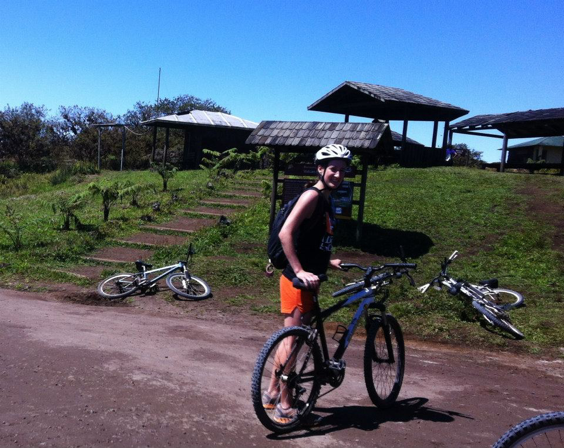 Walking our bikes through the lush, steep hills was beautiful, if difficult work. We sent Joel ahead on his bike to look for the farm, and lucky we did because Joel found his most of his host family loaded up in the truck and about to leave. That load was full, but his host dad assured us he would be back in about an hour for us. Learning about “Galapagos time,” we spent not an hour, but the rest of the afternoon and evening helping the rest of the family plant cassava, playing card games, and having a rollicking good time. While nothing went according to plan, we adapted to our situation and opened ourselves to have a more fun and rewarding day than we could have expected. An adventure, started for the sake of homework, finished with making great friends. After years away from the island we still keep in touch. 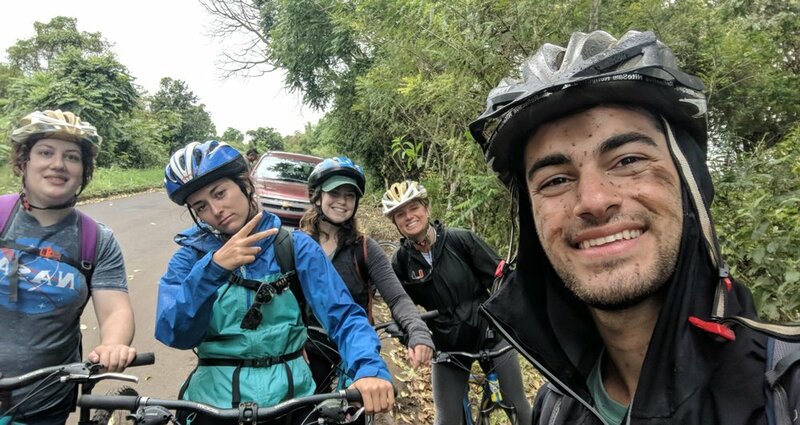 Now that I am headed back to Isabela as IOI’s new Assistant Director for Education and Outreach Programs in Galapagos, I have already emailed my local bicycling friends and planned our next adventure! This program allowed me to get to know amazing Galapagueños, adventurous travelers, and to get to know myself. 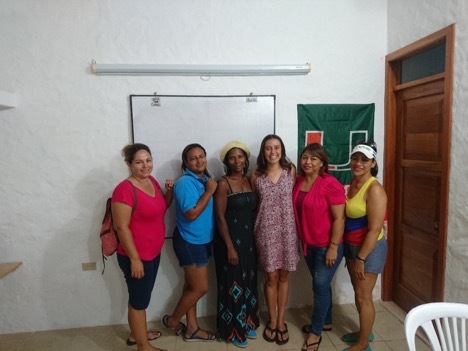 Through UM and IOI’s model for teaching, I found that hands-on experience and learning from local friends and teachers helped me develop and learn more than I could have in a classroom setting. I saw my friend Erika, who had never left the US before our semester abroad and who spoke no Spanish make so many local friends over her time there by developing her talent to communicate without speaking the same language and also committing to learn Spanish. Each of my travels has shaped my philosophy and practice of learning and adapting to other cultures. Meeting the incredible team at IOI inspired me by showing me that it is possible, and in fact crucial, for an organization to interweave conservation, community development, and international exchange. Reflecting back on what I have learnt on Isabela conjures up a whole host of things, a list which is endless - I think it is safe to say that every single person I have met on this island has influenced or taught me something. A tourist passing through taught me a new card game, Nick and Felipe showed me how to fillet a fish, and cook an incredible tuna pasta, locals have helped me with my Spanish, showed me how to salsa, surf and so much more. But, these are all things I can demonstrate I have learnt, I came to the Galapagos prepared to learn about the wildlifeand culture but during the process perhaps most importantly I have learnt a lot about myself, reflecting back on the person I was when I came I can see that my mental approach to life has changed. I have been able to relax and become spontaneous, going with the flow and not afraid when things go wrong. Like the endemic wildlife of the Galapagos I have adapted from the bustling streets of london to the peaceful methodical island life of Isabela. Before they left I asked some of the Spring 2017 UMiami students what they had learnt. Steph who came to Isabela with some Spanish told me that she now understands so much more Spanish and sometimes doesn't even need to think about it. The other big thing she said she’d learnt is to embrace the culture, to relax if something isn't as you expect, there a big culture different here and the island is like one big family, community is definitely an important word on Isabela. From the moment you arrive you get swept into the community, and you know everyone embraces you as part of the family. There are lots of differences but thats what makes the Galapagos so special, you learn to love it and everything that makes the island individual. During my time on Isabela I learnt that being adaptable and easy-going is going to help make the whole experience more enriching. It is likely that 90% of the things you do on this island will be different from your life at home, so rather than finding issues with it make it your advantage, embrace the fact that the experience your living is completely unique to you. It is a great opportunity to get a first hand account of a different culture - no matter how often you travel, no matter how many countries you’ve visited on vacation there is nothing like living and interacting with locals on a daily basis. I learnt to see the unseen by listening to the locals and getting them to take you to the less visited tourist sites and hiking the additional pathway to Volcan Chico with the guide to ensure you see as much as you can, rather than letting the fatigue set in and wait for the group to return from that part of the hike. I learnt so much more about the Galapagos that I would have done by visiting and sticking to a guidebook, I learnt this by talking to people, listening to their advice and making the most of every opportunity. I fly home next week with a wealth of enriched knowledge from my trip, knowledge off the famous Galapagos Iguanas, or how tortoise conservation is bring back the species or no matter what the language barrier is try to communicate with the locals they know what there talking about for they live it everyday. Alongside this I am going to take home knowledge about myself, who I am, how i’ve changed and how my Isabela experience has taught me to be a better version of myself. I hope that all future volunteers have an experience as inspiring and life changing as mine as it is something I will never forget. As I have said goodbye to people on the trip it became a tradition to ask there highs and lows (although the lows were very limited and often included not getting into the island life as soon as they arrived, or not taking full advantage on day one - these are things we couldn't have changed). The high’s seemed to be endless and it came down to a week by week highlight so that everything could be included. My first night here I sat on the beach with Kiki watching the sunset planning everything we wanted to do whilst we were here, time has flown past and last week I sat on the beach with her and as the sunset set on her last night on Isabela. We reflected on the highlights of our and trip and it dawned on us that we have done everything we set out to do and so much more. When I asked her what she was taking away from the trip she couldn't choose is it the passion for life that the locals exude or the exotic widlife? Working with the giant tortoises? Or simply living in the Galapagos? Our island experience has been unbelievable, we both came here looking for something different to our lives at home and we found it and so much more we could never have imagined. The paradise of the Galapagos captured our hearts and is something I know I will never forget. Every time I travel to a new place in the Galapagos, I go with the anticipation of seeing a new animal that I have not yet spotted or getting a better view of one of the unique animals I’ve already had the chance to interact with. Students who have studied abroad in the Galapagos before me always raved about the trip that they took to Punto Moreno on the west side of Isabela so I decided that it was a trip I had to go on. Even though it was a two and a half hour boat ride over to the west side of Isabela, my group and I didn’t mind because we had heard that there was a good chance to see whales and dolphins. We saw lots of dorsal fins on the way over, likely belonging to dolphins, but we never got a good look at anything to figure out what it was. Nonetheless, we took it as a sign that we were in for a great day. Once we arrived at Punto Moreno, we immediately saw endemic flightless cormorants, which only live on the west side of Isabela. The water was only about 20ºC so it was frigid when I first jumped in to snorkel, but the chance to see the flightless cormorants up close for the first time kept me going. I watched as the flightless cormorants stood on rocks near the water with their disproportionately small wings held out, trying to dry off. Most of the cormorants that we saw in this first spot were juveniles; they were a dark brown color rather than black and did not have piercing blue eyes like the adults. At one point, two of them got into a fight, seemingly because one got too close to the other’s rocks. They waddled towards each other, opened their beaks, and started to thrust their wide-open beak in between their opponent’s. It was absolutely comical to watch because the flightless cormorant is not particularly coordinated on land and it was such a strange way to show aggression. After about two minutes, the intruder admitted defeat and went back to his initial rock, a little bit further from the water. After the water got too cold for us to handle any longer, we got back into the boats and went to a new bay where we found Galapagos penguins. There was a group of about 25 penguins swimming along, and I was so excited that the cold water didn’t matter anymore – I just jumped back in and joined them. As someone who has worked with penguins in an aquarium before, I was thrilled to get to see them hunting in the wild. I was awestruck as they glided through the water easily hunting the small baitfish that were all schooled together. We soon came across a rock that was separated from the rest of the island and deemed it “the most Galapagos rock there ever was” because there were three endemic species sitting on it: 1 flightless cormorant, 4 Galapagos penguins, and 2 marine iguanas. There were also 3 Galapagos green sea turtles swimming around it. After lunch, it was time to start heading home and fish along the way. Even though I hadn’t seen any of the really big Galapagos animals I was hoping to, it had still been a wonderful day. On our way back, the boat suddenly stopped and Stallen, our boat hand, ran to the front to look in the water – he had seen a whale shark! I quickly joined him on the front of the boat and got a quick glimpse of her as she dove down and disappeared from sight. I didn’t get to swim with her, but I was satisfied – I had gotten a glimpse of a whale shark and no longer needed to refer to it as “that mythical beast” in order not to jinx myself and decrease my chances of seeing one. A half hour later while we fished, I was once again hanging out on the front of the boat and saw something appear at the surface. It initially looked like the carapace of a sea turtle, and I pointed it out to Steph who was sitting next to me, but neither of us thought much of it. Suddenly it was back again, but this time it didn’t look like a turtle, it looked more like a fin of a manta ray swimming at an odd angle. Stallen came to see what we were doing and we asked what it was – the whale shark was back! We ran back to the main part of the boat and grabbed our snorkel gear, determined not to miss our chance to swim with the whale shark again. I catapulted my body off of the boat and swam in her direction as quickly as I could. I caught up to her in time to swim together for about 20 seconds and then she dove down again and disappeared from sight. Back on the boat, we were all freaking out because we were so excited – Shannon was hysterically crying, Katie was squealing, and all I could say was “Oh my god”. Once we all finally calmed down and started fishing again, the whale shark was back, but this time she was closer to the boat! We all leaped back into the water and watched as she slowly swam by. She swam right under the boat and we were able to watch all 35 feet of her pass and noticed that she was definitely a female and appeared to be pregnant. Her tail was taller than I am and her gills were about five feet large. I kept up at her pace, swimming alongside her, a little more than 6 feet away, as she fed on the abundant plankton. After staying near our group for five minutes, she once again dove down and we lost sight of her. After catching six yellowfin tuna, it was time to head home for real, but it turned out our day of excitement still wasn’t over. On our way, we saw spouts of water being hurled into the air, apparently from a blowhole. A couple minutes later, we finally saw the whale – it had a small dorsal fin and even though we were far away, we could tell it was huge. Later we used pictures of its dorsal fin to determine that we had caught a glimpse of a right whale. As I watched the horizon on the lookout for the whale, I watched as three mobula rays breached, one after the other. Soon after, there was a flock of blue-footed boobies dive-bombing the water to feed on a school of fish. After we got back from Punto Moreno, I realized that my Galapagos animals bucket list has been completed. I’ve swam with or seen all of the Galapagos’ unique flora and fauna including an orca, sea lions, green sea turtles, marine iguanas, scalloped hammerheads, giant manta rays, common dolphins, and dozens of species of fish. My time in the Galapagos is quickly coming to an end, and even though I don’t want to leave Isabela, I still consider myself lucky: lucky to have had the opportunity to spend three months here, lucky to have met so many incredible people, lucky to have seen so many incredible creatures, and most importantly lucky that a place like the Galapagos still exists. I envy the simple way of life that is maintained in Isabela, where people live harmoniously with the incredible natural world around them. Isabela, Puerto Villamil, and IOI have become my second home. From the moment I leave, I know that I will constantly be on the lookout for an opportunity that will take me back to this extraordinary and unique place. Ben is a student from the University of Miami, he has spent three months living with a host family and living on Isabela as part of his study abroad program. Ben has spent a lot of his free time on the island surfing at El Faro (the surf beach), and has for his Service Learning Project he has been conducting evening walks along one of the beaches looking for signs of sea turtle nesting. Ben was lucky enough to witness a sea turtle heading up the beach to begin nesting. What do you do in your free time/weekends on Isabela? I paid to rent a surfboard for my last two months here, so on my free time and every Saturday I make sure to go out to the surf beach and surf as much as I can. On Sundays, I go on trips with my host family where we have picnics and play soccer at local beaches, such as Playa del Amor or El Estero. What Interested you in the Galapagos? And the Study abroad program? The Galapagos are famous for being the inspiration for modern evolutionary biology, so as a biologist I have always been interested in coming here and seeing all of the famed wildlife. When I was still in high school, I found out the University of Miami had a study abroad program to come here, so I knew I had to attend Miami and take advantage of this incredible opportunity. How did you become involved with IOI? How long are you going to be part of this program? What are your goals? Why are you participating? My goals for coming to the Galapagos were to see all of the unique animals and to see the same unique patterns that inspired Darwin's theory of evolution. How are you liking the experience? Living in the Galapagos has been an incredible experience. Even though the islands seem small, there is an endless number of things to see. There are so many large creatures in the Galapagos, and unlike other places in the world, you see them all the time! Living in the Galapagos for multiple months has also allowed me to learn about the island culture and puts my life back in the States in a whole new perspective. Would you recommend this to other travellers? Absolutely. The Galapagos Islands are like nothing else in the world and you will not regret coming in any way. For people coming after you is there any advice you’d tell them? Be ready to eat lots of fish, and overall less calories in general than what is considered normal in the States. Invest in some jam at a local store, and then always have lots of fresh bread from a panaderia on hand. The one thing you wished you’d pack. Lots and lots of CLIF bars. I brought 12, but they disappeared fast. One thing you regret bringing. Not really anything. I've used basically everything that I packed, and stuff I haven't used is mostly medication just in case I get sick. Probably the most amazing part of my time in the Galapagos was when I got to swim with giant manta rays on my way to Los Tuneles. Our boat captain spotted one from the surface, so we slowed our boat down to get a closer look. Once we noticed that there was more than one in the water, the captain told us we could quickly put our gear on and swim with them. When I first jumped in, the one we were following was pretty far away, so I only saw its outline and thought that was it. However, when I looked back to the boat, the deckhand was pointing me in another direction. Sure enough, I turned around and clearly saw a giant manta about 20 feet away! As I kept swimming around, I saw 3 or 4 more giant mantas, and one swam straight at me. It was an incredible, unforgettable experience. Dylan is a University of Miami student who is visiting the Galapagos as his study abroad program. During his time on Isabela he has worked at the Tortoise Conservation Centre - as part of his Service Learning Project, this has involved cleaning corrals, and assisting various jobs around the centre so that it remains in great condition for the tortoises and is a great experience for visitors of the centre. I enjoy going to the beach, going snorkelling, surfing, and spending time with my host family. I picked this study abroad program because I had friends that went on it in the past and absolutely loved it. The number of trips the students get to take is amazing and I knew that I would love every single one of them. The third reason was I hadn’t been to South America before and I really wanted to come. My biggest goal coming here was to improve my Spanish because I have taken Spanish for the past 4ish years and I have never had the chance to use it outside of the classroom. I was really excited by the idea of using Spanish as my primary means of communication with people around me. Since I got here, I also really enjoyed learning how to surf because I never had the chance when I was younger and I want to get even better at it. Another goal was improving my free diving skills because we free dive in a lot of our classes and I wanted to be able to spend more time underwater and be able to dive deeper. I feel that I have managed to achieve all of these goals in the three months I have been participating in the IOI Study Abroad program and I plan to continue improving my Spanish once I have left Isabela and continue on my travels around South America. I absolutely love Isabela! The people here are so nice and it is a big change from life in the US. The field trips have been amazing and we have gotten to see some things that I thought I would only ever see in books – like manta rays, marine iguanas, Galapagos penguins, and hammerhead sharks. I know that I will come back to the Galapagos in the future!! Yes! It is a great way to see the Galapagos and makes you feel like you have found a second home! I really wish I brought my hammock from home as it is one of the best ways to spend an afternoon or see the sunset. I regret bringing so many long sleeves because you just don’t need them down here! The highlight of my trip was seeing two giant manta rays at Tortuga, it was the coolest thing I have ever seen! I couldn’t believe how big they were! As my semester in the Galapagos comes to a close, I have three months of memories and accomplishments to reflect on. One of the many accomplishments I will be able to look back on is the community service I did in Puerto Villamil, collecting trash from the beach and trails within Galapagos National Park. It may not be the most glamorous community service project, and many people would never understand why I would ever want to do it, but there’s no project I would trade it for. I remember one morning in which I was too sick to do my community service and when I saw the other student return I was surprisingly upset that I couldn’t have gone. That was the moment when I realized how much this community service had impacted me. Every day when we go out to the beach we fill two full sized trash bags. Now take that mental image (if possible) and multiply that by 16 days. The trash really adds up quickly and I’m very proud of the difference we’ve made. Every piece of plastic, or bottle, or melted balloon picked up is another creature saved and makes this small town that much more beautiful. I feel like I’ve made a huge impact and I truly hope that students and locals are encouraged to continue to clean the beaches in the future because it is both rewarding and necessary. Cleaning up trash has also changed the way I see the Galapagos. When I first came to the Galapagos I felt like it was a pristine environment and it was just inherently better than the United States when it came to garbage disposal and pollution. Then I started cleaning the beaches and although my attention was drawn to the fact that pollution is a problem, the beaches are much cleaner than the United States. Not too much later, I had reached a point where my eyes would naturally focus on litter and I realized there is garbage absolutely everywhere. Even when hiking to the top of a volcano or looking at rocks in the middle of nowhere, there is always garbage. Especially around town, there is almost as much trash as there is lava rock lying in the streets. The longer I’ve been here the more I’ve come to realize that wherever there are people, there will be a footprint of litter, and the Galapagos is no exception. It is especially disheartening to be aware of the fact that a lot of the garbage in the streets is the result of stray cats and dogs, and that the issue is more complex than just human laziness. As I prepare to leave Isabela, I have to say goodbye to the soft sandy beaches and maze-like mangroves I’ve come to know like the back of my hand and get ready to embrace Miami. For this upcoming summer, I’ve decided I’m going to continue to go to the beaches twice a week to pick up trash. I may not be able to help this community any longer but I now have an obligation to help my own community and keep the beaches clean all over the world. I’m also hoping that I can inspire friends to come with me and become as passionate about picking up trash as I have. I am part of organizations that require community service hours and I really think getting these organizations involved can make a tremendous difference. On a slightly different note, I’ve come to realize not every pollutant on the beach is really trash. Over the course of the semester I’ve found plenty of interesting items that I plan to keep. Some of these items include: a very useful keychain holder, small decorative knick knacks, and a whole lot of sea glass. I am a strong proponent that making use of the garbage I find is much better than letting it waste away in a landfill and I’m truly excited to keep collecting in Miami and find more hidden treasures. The Galapagos Islands are incredibly unique. Sitting far offshore from the South American continent they have a unique blend of isolation and ties to other regions. From a biological stand point, the islands are tied to other regions of the world through currents and winds that brought species to the islands. The Islands are also so isolated that they have developed high number of endemic species (species only found in the Galapagos) such as the marine iguana or the blue footed boobies. This pattern is also reflected in the human population. In the early days of Galapagos settlement, the islands were colonized by pioneers. These people lived off the land and rarely made contact with outsiders. Now, most of the people on the island have ties to mainland Ecuador. People here see the Galapagos as an escape from hectic dangerous life in Guayaquil or the hustle and bustle of Quito. Life here is often described as ‘tranquilo’ or calm. Not only do the people here have ties to mainland Ecuador, as the economic balance of the islands switches to tourism, the locals are becoming dependent on tourists from all over the world. Initially the Galapagos started as just a pioneer haven then, as people began to fish the islands, coastal towns began to develop. Now, the economy of the Galapagos has shifted to be based on tourism. I look at my service project as a way to ease the transition to a highly tourist dependent economy. For the past ten weeks I have been teaching English classes through IOI. The host families must attend two out of the three classes offered by IOI. Mine is the least popular. Many of the families want to learn but have a fear of starting or really committing to learning. The moms who attend my class are all very eager to learn. All of them have or had host students at one point, so learning English will benefit their communication with their student. In some of their professional lives English is critical; one runs a hostel and another owns a restaurant. 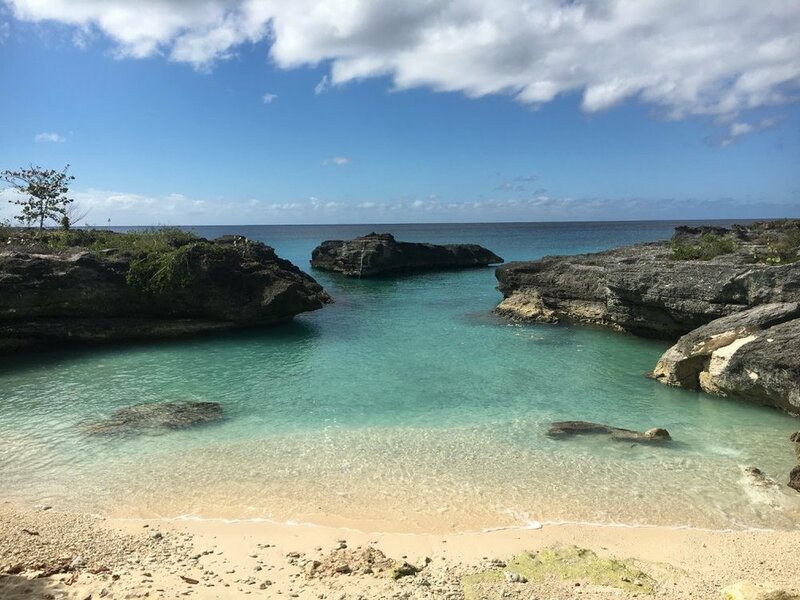 I look at what I have been doing as a way to empower locals to take charge of their growing economy to mitigate the effects of foreign business coming into the islands and taking charge of tour operations with a local as just the face of the company. I have thoroughly enjoyed my service project not just because of the way I can give back to the community and make life for some of the locals a tad easier but because of the challenges it has presented me and the way it had made me grow. Firstly, it made me think of English in a different way with a new perspective. I was forced to step into my students’ shoes and understand what they found difficult and what they were stuck on. I was forced to be very creative through this experience. I have had to come up with fun games, vocabulary list, phrases, and verbs for my students to learn from. I have also had to make decisions on what is the most important for them to learn. With around only ten weeks of classes for just one hour a week, I had to concentrate my time on what is most important for them to learn and understand. Finally, this service project has made me more confident. I have always been fearful of using my Spanish, especially in front of a lot of people or with authority. With the class I had to put fear and inhibitions aside and use the tools I had to teach the class to the best of my abilities. I am so thankful to the members of my class for coming with curiosity and determination, IOI for offering such a wonderful experience and to the community in Isabela for making me feel welcome for the last eleven weeks. Waking up on Saturday morning I headed off with some other IOI volunteers to explore the lava tunnels on the south west side of Isabela. This is one of the many tours you can book and do during your free time on the island. This is a full day tour and allows you to travel an hour around the coast to see some spectacular wildlife. Heading out for the day we get on the boat and we are excitedly scanning the water in the hope to spot some wildlife, before we had even left the dock we saw a ray swimming past - surely this is a good sign for the day ahead. Our journey took us around the coastline of Isabela, we sailed relatively close to the shoreline for about an hour with incredible view of the Volcan Sierra Negra and Volcan Cerro Azul on the horizon. Just over half way we reached the enormous rock called Roca Union, where we spotted our first Nazca Boobie, one of the famous inhabitants of the Galapagos. Other than the birds living on the rock the surrounding area is nothing but deep sea, there were a few sea lions napping in the sun but this sight was like something from a movie. The azure blue ocean was crashing on the rocks and we circle the rock a few times enjoying the picturesque views. The water is a mix of aqua marine, blue, white and the Nazca Boobies perched on the top seem oblivious to the treacherous waters below - it seemed like a setting from Homer’s Odyssey. We reached the lava arches of Los Tuneles, and our captain navigated carefully through the shallow lava tunnels. Inside the breakers the water is calm and clear, a near reflective surface was created due to the cloud morning the view was spectacular. We spent some time cruising slowly through the arches watching blue footed boobies, iguanas and the occasional sea turtle the views are unparalleled. Hopping off the boat we began to explore the maze of lava tunnel arches, and spotted some Blue Footed Boobies, we were incredible lucky because it was mating season and the male Blue Footed Boobies were putting on a show to impress the females. To attract the female they show off their blue feet by strutting from one side to another, and begin their mating ritual dance by “sky-pointing” which involves pointing their beak to the sky and raising their tail and wings to impress the female. Jumping back onto the boat we head to our first snorkelling spot, the water was calm and still with the waters being protected by lava formed tubes and rocks, even looking from the boat you can see wildlife in the crystal clear water. Our first snorkel took us through the arches, duck diving through the underwater tunnels our guide showed us some incredible views and wildlife - it was spectacular. Being passed by sea lions, they were twisting and twirling through the water like acrobats exploring the rocky landforms. Back on the board the boat took us around the coastline to a snorkelling site near a mangrove forest - we weaved through the rocky coves and shallow tunnels which allowed us to see schools of fish and sea turtles. It was exciting to see the green sea turtles which are impressive due to their size and gracefully movements in the water. Diving down to the bottom we were able to see a seahorse camouflaged by the sediment. The guide finally asked us if we wanted to see some “big fish” and of course the answer was yes! One by one we ducked down and under a rock and saw a massive group of sharks swimming in the cave - the sight was incredible and I soon forgot about holding my breath and watched in awe as the sharks swam around the enclosed area not even bothering to acknowledge the swimmer peering into their underwater world. The whole day was unbelievable and I arrived back at the dock exhausted from an amazing day snorkelling and exploring the island. This tour was one of the best ways to spend a day on the Isabela. Where else in the world can you snorkel in shallow waters with white-tipped reef sharks, sea turtles, sea horses and so much more!